We’re going to address all these points now. As you can see, the currently active project is “Kate”, and it’s contents is listed in the tree view. Clicking on files in the tree view opens the file in the editor. Further, a context menu is provided with which you can open files with other applications, such as a .ui file with Qt Designer. The idea is that you never have to open a project manually, this is even not supported at all. 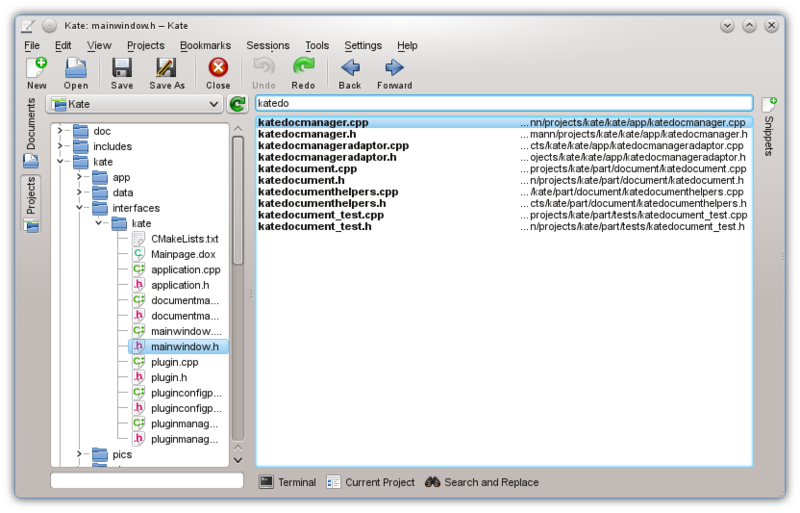 Hence, what happens if you open a file, the Project Plugin quickly scans the folder and its parent folders for a .kateproject file. If found, the project is automatically loaded. Very simple and efficient. Further, if you open another document in Kate, that belongs to another project, the Project plugin automatically switches the current project. So intuitively, always the correct project is active. Of course, you can also switch the currently active project through the combo box. With the knowledge of all files belonging to a project, the Project plugin provides simple auto completion facilities based on ctags. If a project is initially opened, ctags parses all project files in a background thread and saves the ctags information to /tmp. This file then is used to populate the auto completion popup in Kate. In contrast, without this auto completion, Kate was only capable of showing auto completion items based on the words in the current file. So the auto completion provided by the Project plugin is much more powerful. If ctags is missing, a passive popup warns you about this. It is also noteworthy, that the ctags file in /tmp is cleaned up when Kate exists, so you the plugin does not pollute any folder with unwanted files. You can filter by typing parts of the file name you are looking for, and you can also navigate with the arrow keys and page up/down through the list. Hitting enter activates the selected file, while escape hides the quick open view again. Further, the quick open remembers the previous file. So when you change to the quick open view the previously activated file is automatically selected and you just need to hit enter, which comes very handy at times. Another feature is to have support in the Build plugin, so that it automatically is configured correctly. As you may have noted, this is JSON syntax (because there is a nice jason library for Qt to parse this). The project name is “Kate”, and the files contained in should be read from git. Here, subfolders and filters define what’s part of the project. You can also mix version control and files based on filters. Hopefully, these examples help you to setup your own project. So, no kdevelop simple import? Per-project coding style support would be a killer feature for Kate. It’s now very tedious to edit multiple projects at once when they have different coding styles. 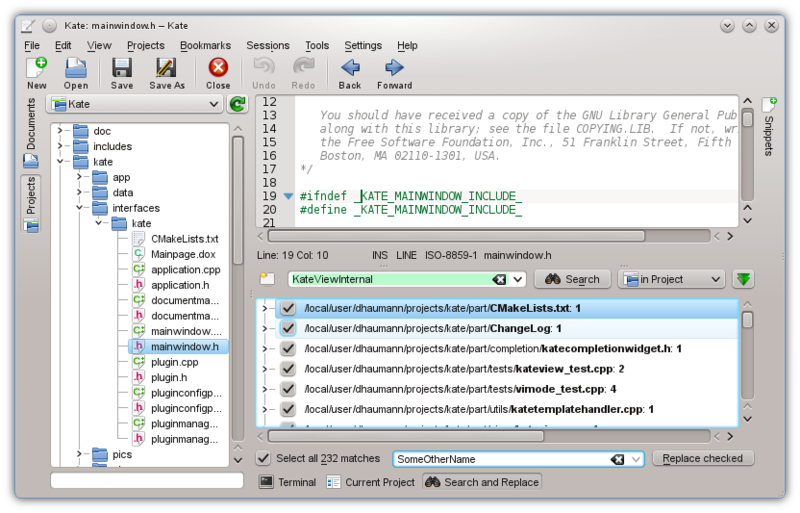 Besides, this plugin is a Kate application plugin, while all the configuration comes from the Editor Part. Hence, both parts are completely separated for a technical reason. 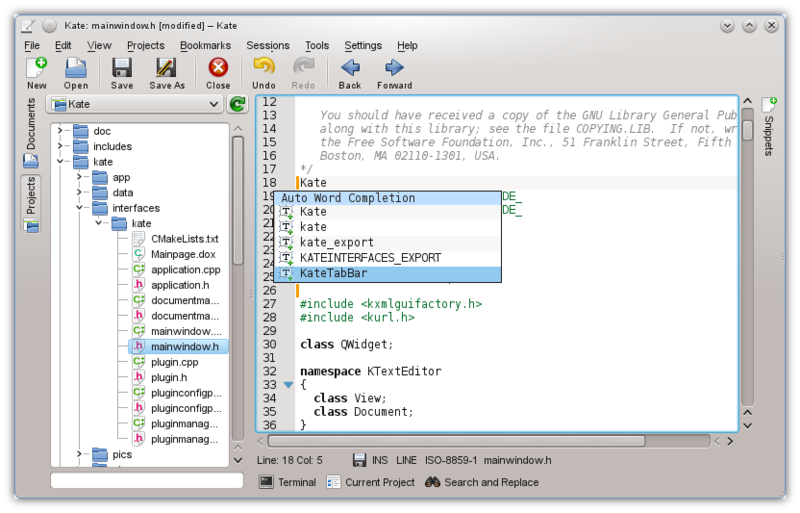 Thus, you have this editor part also in KDevelop, Kile and other applications. You are doing and amazing job!!! This plugin is great, exactly what I missed from kate. Are sessions and projects meant to work together or fulfil they a different need? I currently use the build and gdb plugin, where I require (especially for gdb) multiple targets. Will I be able to configure this in the future in the project plugin or will they remain separated? Projects are for a different need: Quick file access and fast switching. Sessions: specific plugin configuration (including the Projects plugin), remember open documents and other configuration. With respect to the gdb-plugin: please open a bug report, then Kåre will read it. Does it work with remote sftp:// files? How can I add a created .kateproject to Kate ? Does it work wish fish:// ? But what is the answer ? There are several isLocalFile() queries in the Projects plugin source code, so I guess it only works for local projects. I may be wrong, though. Why don’t you just try it? I stumbled upon this as I was trying to figure this out for myself. It definitely does NOT work via sftp:// which is unfortunate – it would be very useful. All of my dev work is stored on a remote VPS, so I’m unable to use the project plugin. I suspect that it would be pretty slow, anyways. Oh well, I’ll probably come up with some way to integrate this into my workflow. How do you set filters for current directory? Are you sure you don’t have a syntax error? Is the project listed in the Projects tab? Can be cool, if you add a configuration option o pop-up for auto create a project if a git repo is found when a file is opened. I think this is a very good idea. Would you like to work on this? I’d guide you through this. 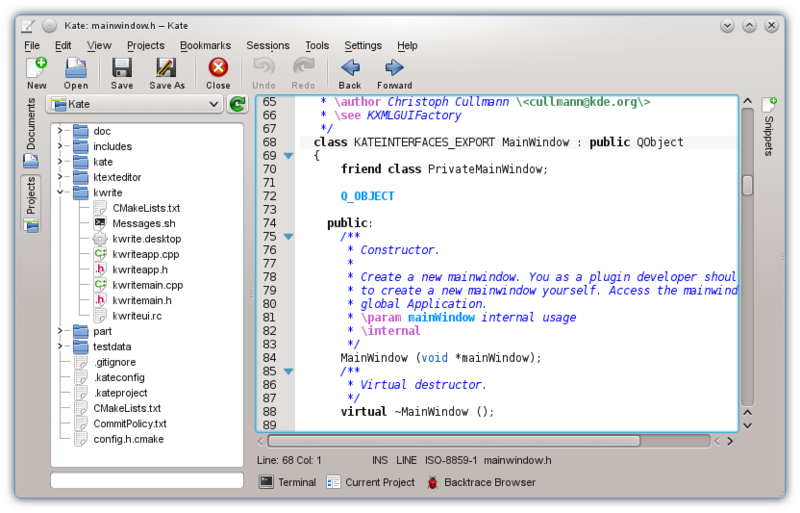 However, I failed to figure out, how to define multiple projects in .kateproject. I would like to have the following two projects but whatever syntax I try, it does not work. I am just curions to know. This is no real problem, because the two ‘projects’ are in different subdirectories with their own .kateproject-file. I’ve tried everything listed here. Kate will not list my project in the drop down & the “Open Projects” menu item is gone on recent builds. Can we get the manual open back please? Make sure the filename is “.kateproject” and not “bla.kateproject”. And then, just open a file in the respective (sub)-directory. The project will then automatically be opened. I’m having difficulty getting this to work. Using kate 4.11, my .kateproject is listed below. It works perfectly. Any idea? “filters”: [“.htaccess”] does not work. How can I do this? Please post your complete .kateproject file. Hi, that’s cool feature for Kate. How can I specify custom target in project build config part? Hi, I like the project plugin very much. Is there a way to open recently used projects similar to recently used files? When manually specifying files to included, everything is fine. But when using “git” mode, files with non-ASCII file names (for example, Chinese characters) will not appear in the project sidebar, even if they are actually included in the git repository. This is great. I have a few issues, though. Apparently files are not being reload in the project file list. If i create new files, they do not appear under the files list and i can’t open them through the quick file open dialog. The refresh button is not working. Just ran a dnf update (kate version is now 15.08.1) and its broken. I just see and no other files. Was one of my favorite features.